See more objects with the tag home, rounded, entertainment, rectangular, dense, portable, muted colors, electronics. This is a Portable television. It was manufactured by Sony Corporation. It is dated 1959 and we acquired it in 2013. Its medium is formed, bent, and enamelled metal, molded glass, molded plastic, electronic components. It is a part of the Product Design and Decorative Arts department. 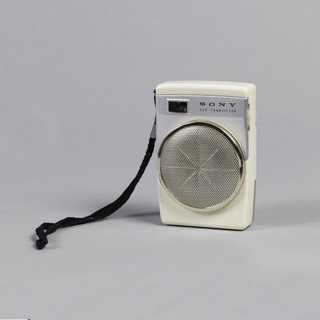 Sony began in Tokyo in 1945 as a radio-repair shop. In the 1950s, it developed a reputation for transistor technology, which it used in portable radios. In 1959, the company adapted that technology to the television set and the resulting product was the TV-8-301. Launched in May 1960—the same year Sony Corporation of America was established—it caused a monumental shift in Sony’s product line, and was a game-changer for both the company and the industry. The TV-8-301 marks many important moments in television history. It was the world’s first fully transistorized television set. It was also the first direct-view transistor TV and the first Japanese TV to be sold in the United States. 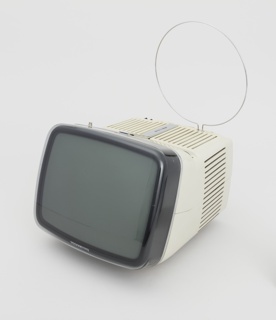 The set reflects the state-of-the-art technology of its day, when the transistor was used instead of a vacuum tube, allowing the object to be small and portable rather than the furniture-like designs of previous television sets. For example, in contrast to Philco's Safari portable TV, which had a vertical picture tube and depended on angled mirrors that reflected the image on a narrow field of vision, Sony’s picture tube was mounted horizontally, allowing the picture to be viewed from all angles. Its curved shape is derived directly from the tube; the designers removed excess material to minimize the object’s size. The set also introduced the now-famous style of a centralized SONY logo. 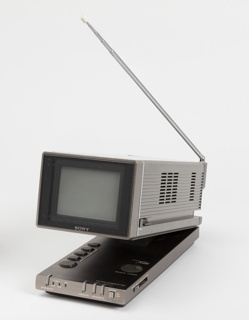 Sony’s co-founder, Akio Morita (who owned this exact example of the TV-8-301), famously did not believe in market research for new products. He believed Sony was the expert at devising new products and introducing them to consumers. The TV-8-301 stands as a testament to this idea. Marketing experts in the United States did not think that small, portable television sets would sell—they believed the public wanted larger sets. Yet the TV-8-301 launched Sony’s TV business. Two years later, the TV5-303, an even smaller model, became a huge hit in the US. The acquisition of this early portable TV would be an asset to the museum’s collection. 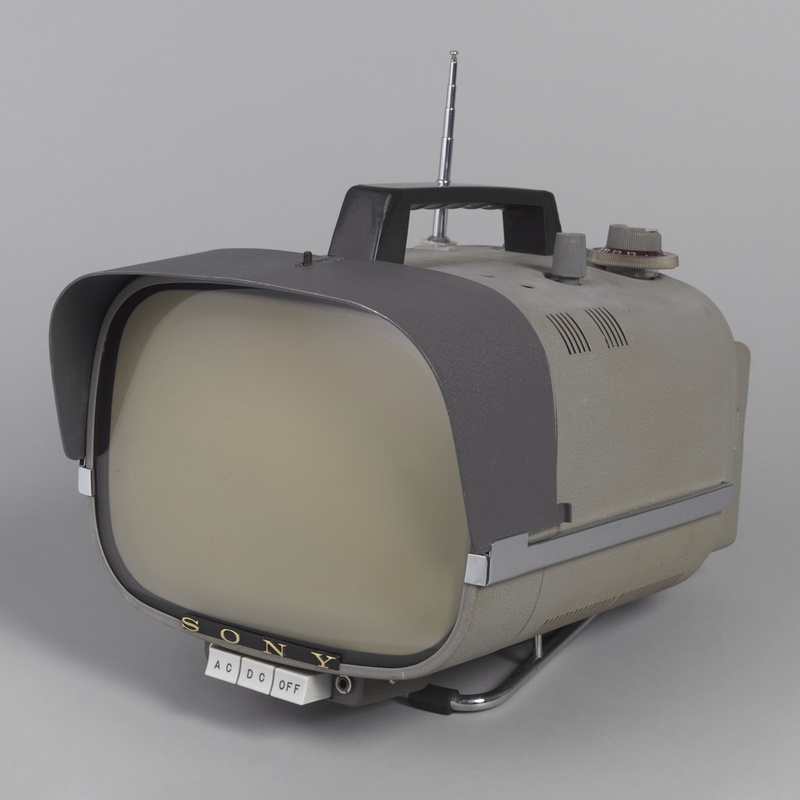 At the time of proposed acquisition, the collection includes three other televisions from this period: a Braun TV (1958), a Philco Predicta set (1959), and a Wegavision 3000 (ca. 1960). The TV-8-301 would serve as a counterpart to these larger examples, and would also demonstrate the goal of the time to minimize the size of appliances. 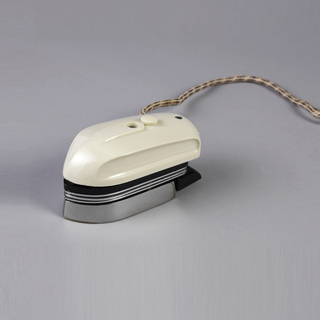 The museum would like to enhance its collection of important mid-century electronics, as they represent a significant segment of the growing consumerism and changing lifestyles of Americans in the postwar decades. This object was featured in our Object of the Day series in a post titled The smaller the better. It is credited Gift of Hiroko Onoyama. cast metal, molded plastic, fabric (cord). molded plastic, perspex, chromium-plated metal.